Genea-Musings: Amanuensis Monday - Post 326: Will of Joshua Fisher (1588-1674) of Medfield, Mass. Amanuensis Monday - Post 326: Will of Joshua Fisher (1588-1674) of Medfield, Mass. at the Discretion of my Executors hereinafter named. ever did possess ayther in old England or in New England. other tenn pounds in good & currant Country pay. pa as they shall come to one and twenty years of age. com to one and twenty yeares of age. witnes this thus done as Attests Free Grace Bendall Record^r. Recorded & compared p. Free Grace Bendall Rec. Massachusetts, Wills and Probate Records, 1635-1991, indexed database with digital images, Ancestry.com (http://www.ancestry.com), Suffolk County, "Probate Records, Vol. 5-7, 1666-1674," Volume 6, pages 121-124 (stamped), images 260-262 of 922, will of Joshua Fisher of Medfield, 1674. This will reads like a stream of consciousness, doesn't it? He signs it and then immediately adds a codicil to finish it. 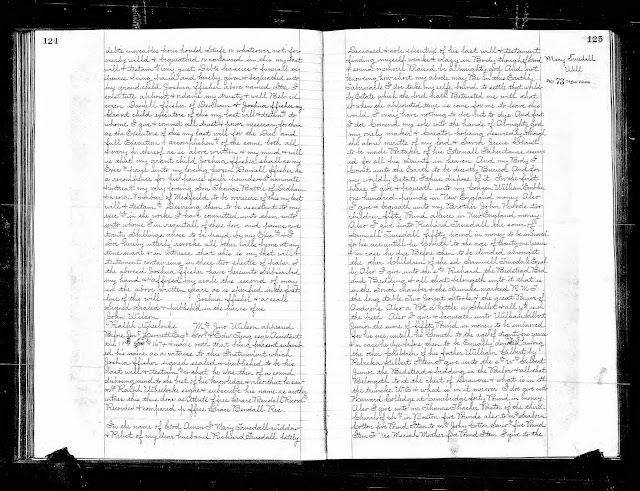 The record shown above is a probate court clerk's copy, and the spelling and some of the names are inconsistent, but probably the best that a skilled amanuensis could do with the original two pages. I checked the Suffolk County Probate Dockets, and these are the only two papers in Docket 711. * Anne, his "deere and well beloved wife"
Of the 8 children of Joshua Fisher (1588-1674) and his first wife, Elizabeth, only daughter Mary (Fisher) Battle was still living when Joshua wrote his will. Sons Joshua and John are, apparently, the only other children that married and had children of their own, and they are deceased in 1674. Son Joshua Fisher (1621-1672) married Mary Aldus (1623-1653), and they had seven children, including Mary (Fisher) Clapp, Abigail (Fisher) Holton, Joshua Fisher, John Fisher (1652-1727), and Hannah (Fisher) Burroughs. Son Joshua Fisher married (2) Lydia Aldus (1621-1683) and they had two children, Vigilance and James, who died in infancy. Son John Fisher (1634-1668) married Elizabeth Boylston (1640-1665), and they had four children, but only Elizabeth (Fisher) Plimpton (1659-1674) and John Fisher (1661-1755) lived to marry and have children. Joshua Fisher (1588-1674) bequeathed real or personal property to each of his known living heirs at the time he wrote his will on 2 May 1674. Joshua Fisher is my 9th great-grandfather. I am descended from son Joshua Fisher (1621-1672) through his son John Fisher (1652-1727), and also from son John Fisher (1634-1688) through his daughter Elizabeth (Fisher) Plimpton (1659-1694).